Although most types of ferns require high humidity, Rabbit Foot Fern is much easier to please as indoor ferns. 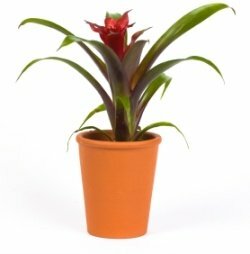 House plants will thrive with indirect light and average room temperatures. Elegant, lacy fronds create a lush mound of evergreen foliage. The main attraction of this plant, however, are the furry rhizomes that hang over the side of the container. These light-brown, creeping rhizomes are covered with hairs that look like a rabbit's foot. 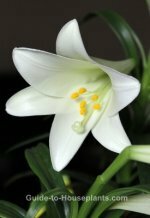 It's a good idea to put the plant in a hanging basket because they can grow up to 2 ft (60 cm) long. And because you want to show them off, don't you? Those furry rhizomes are more than eye-catching -- they take up moisture. Mist them every day -- or as needed -- with tepid water to prevent them from drying out. Winter care: Cut back on watering during the winter months, when growth slows. Put rabbit foot fern in a cooler spot for the winter, but don't expose it to temperatures below 55°F/13°C. Keep it away from heat vents and drafts. This Pacific island native tends to lose some of its leaflets in winter. This is normal, and don't worry...this vigorous plant will replace them. Raising the humidity can help. Repot in spring only when it gets crowded in its pot. 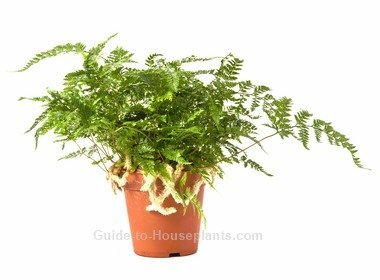 Rabbit's foot fern has a shallow root system, so move it to a shallow pot only 1-2 in (2.5-5 cm) wider. Keep the furry rhizomes on the soil surface because if you bury them, they'll easily rot. This is a good time to divide the plant, if you want. You may find this fern in garden centers and nurseries in spring and summer. You can also buy rabbit's foot fern online. Light: Moderate to bright light. Keep it out of direct sun, which will scorch its leaflets. Fluorescent grow lights work well, too. Water: Spring through fall, keep the soil moist, but not soggy. In winter, allow top 1 in (2.5 cm) of soil to dry out between waterings. Humidity: Moderate humidity. Hot, dry air will cause frond tips to turn brown. Trim off brown leaf tips and raise humidity around it. Use a room humidifier or place pot on a tray of wet pebbles. This fern also loves to be misted. Temperature: Average room temperatures 60-75°F/16-24°C spring through fall. In winter, keep it on the cool side with a minimum of 55°F/13°C. Propagation: Division. In spring and summer, divide rhizomes, each with roots and stems attached. Pot in moist potting mix. The rhizomes hold a lot of water, so be careful not to overwater or they'll rot.